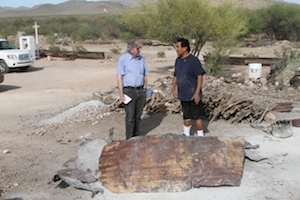 I am in Arizona on the western side of the Tohono O’odham Indian Reservation about 15 miles from my home on the reservation on State Route 86, searching for the junction of Route 24 (State Route 86, Mile Marker 65) which will take me to the village of Hickiwan. This village of several hundred people is one of more than a dozen that dot the 2.5 million acre reservation. 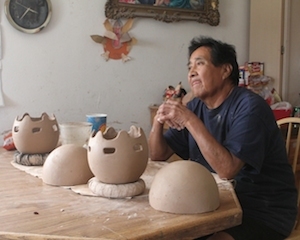 I want to find Rupert Angea, one of just a few native potters still making beautiful clay creations. I want to see some of his work, learn how he makes them, and see if this skill is being passed to a new generation. I locate my turnoff and drive north on a well-maintained highway toward the village. I drive through a dry landscape of volcanic mountains, Saguaro cacti, and coyotes. After 20 miles of travel, I spy the large H on the mountain near the village of Hickiwan. I turn right onto a bumpy dirt road near the Community Center and find the home of Rupert Angea near a circular area outlined with white stones. Several dogs playfully approach my truck to inspect it. The house is covered with white stucco. A red car is parked near the house. Angea warmly greets me and invites me into his home. His home is a combination living and work area. There is a hutch near the front door filled with finished pottery. The dining room table/work bench is filled with pieces he is making. Angea tells me that he uses two types of clay from the area, white and red. He learned his trade from his mother, who learned it from her mother. Pots made of white clay are used for decoration and those made of red clay for food and water storage. Most of his creations use the white clay, since the members of the community use plastic containers for storage. Pots are decorated using dye obtained from local plants. The decorations include pictures of local animals, geometric figures, and the Man in the Maze. The Maze is a very common pattern which describes a man’s journey through life. Angea uses red and black dyes for most of his pots. The decorated pots are hardened in a fire pit near his home by placing them into a metal wash tub covered with a piece of sheet metal and heated for about one hour. Angea spent the last few minutes of our time together telling me how he has made a living selling these pots. He is sad that so few people are learning his skills. It is getting late in the day — time to leave. But first I choose one of the pieces I saw when I first arrived and purchase it for my collection. It is a five-inch-high clay model of a Tohono O’odham lady carrying a pot on her head. The piece, made of white clay, is painted brown. Her face, arms, and the pot on her head are all painstakingly decorated. I am very pleased with my prized possession. If you want to own one of these wonderful creations, you can usually find them displayed at the Gu Achi Trading Post in the village of Quijotoa (Covered Wells) on the Tohono O’odham Reservation. To find the trading post, look for the junction of State Route 86 and Indian Route 15 (State Route 86, Mile Marker 92). If you are more adventurous, you can visit Angea at his home in Hickiwan, place an order for a custom pot, or see what he has available to sell.